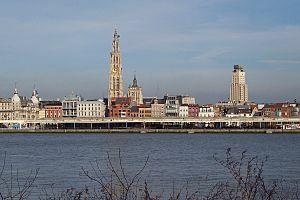 The Onze-Lieve-Vrouwekathedraal (Cathedral of our Lady) and the Scheldt river. 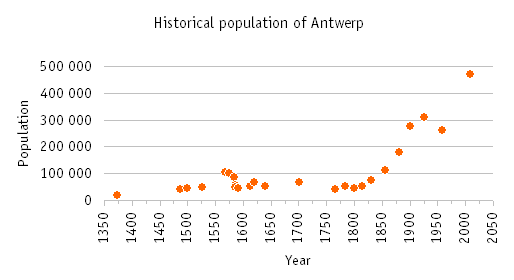 The Sack of Antwerp in 1576, in which about 7,000 people died. Antwerp City Hall at the Grote Markt (Main Square). 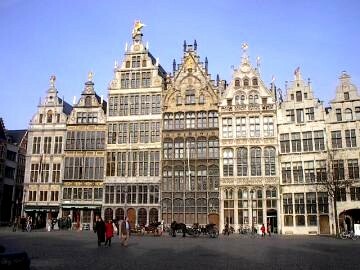 16th-century Guildhouses at the Grote Markt. The Onze-Lieve-Vrouwekathedraal (Cathedral of our Lady), here seen from the Groenplaats, is the tallest cathedral in the Low Countries and home to several triptychs by Baroque painter Rubens. It remains the tallest building in the city. Het Steen (literally: 'The Stone'). Terminal at the Port of Antwerp. 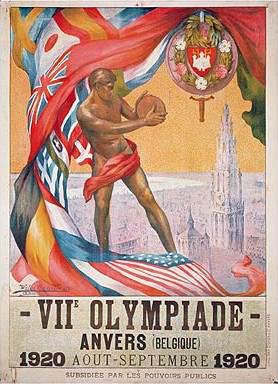 Official poster of the 1920 Summer Olympics in Antwerp. 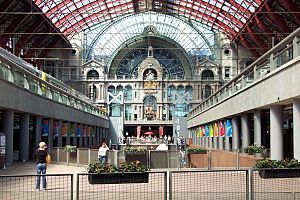 Main building of the Middelheim campus at the University of Antwerp. Antwerp Facts for Kids. Kiddle Encyclopedia.